Snacking in between meals is more important to make your meal light and healthy. Yes, you need to snack in between your big meals, that way you won't starve your body and allow to do its job properly. All you have to do is pick a healthy snack. If it's a mid-morning snack, i will always go for a fruit. These days, i have an orange or few slices of pineapple or papaya. In the evenings, i try to have green tea along with some nuts, or otherwise i make this quick sundal/stir-fry. 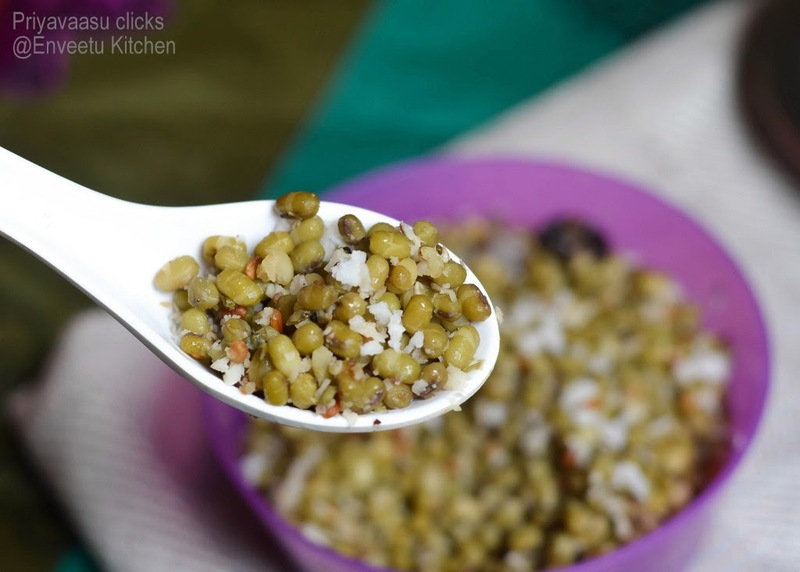 This can be made with any lentil/legume. 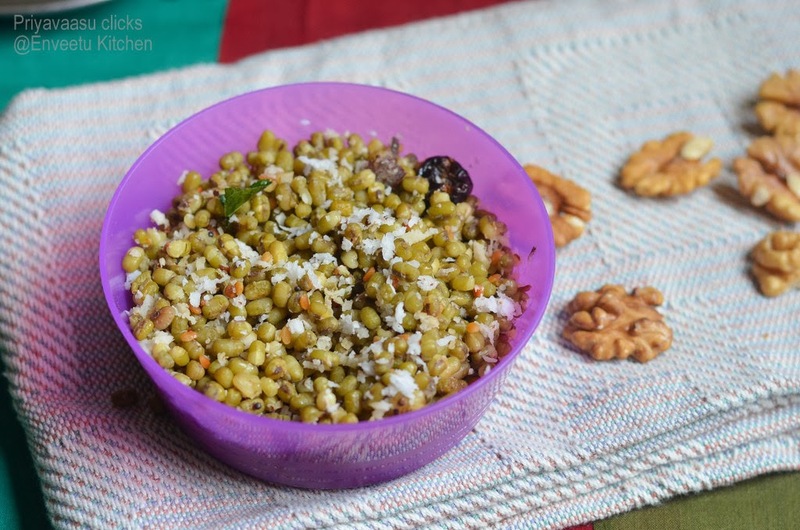 Today, i m posting a simple sundal using sprouted green gram. 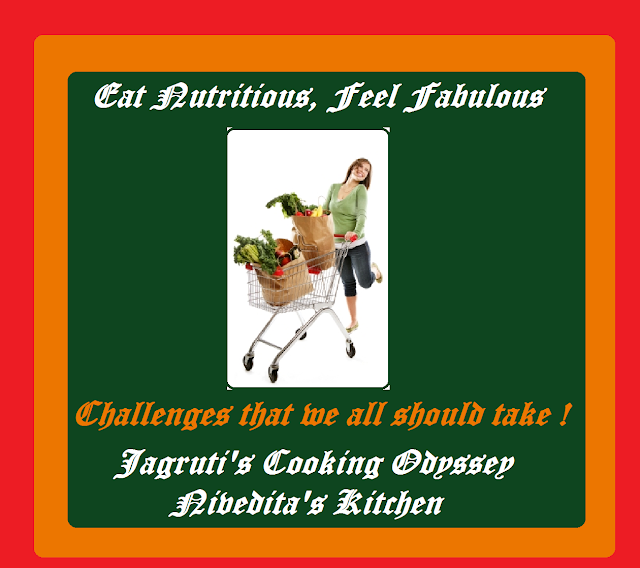 i have told, how i make my sprouts, will try to do a separate post on sprouting lentils @ home. 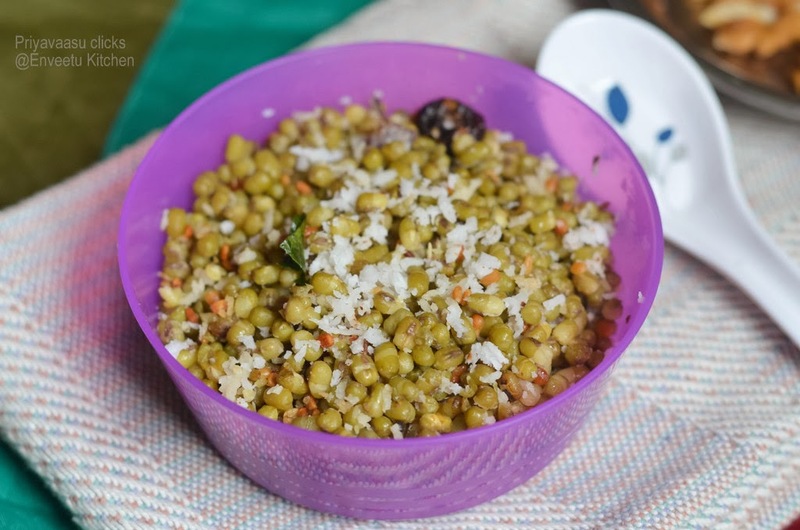 Wash and soak the green gram overnight, next day morning, drain the excess water and let it sit in the colander for 30 minutes, for the water to drain completely. Then take the green gram in a cotton towel, bundle it up with a rubber band,or tie a knot using the same towel and let it sit this way in warm place overnight. Next day morning, you can see small sprouts, sprouting from the gram. Leave it the whole day bundled up in the towel. By evening, transfer it to a ziploc pouch and store it in the freezer. Use it within 15-20 days. I normally sprout around 2 cups of green gram every month. 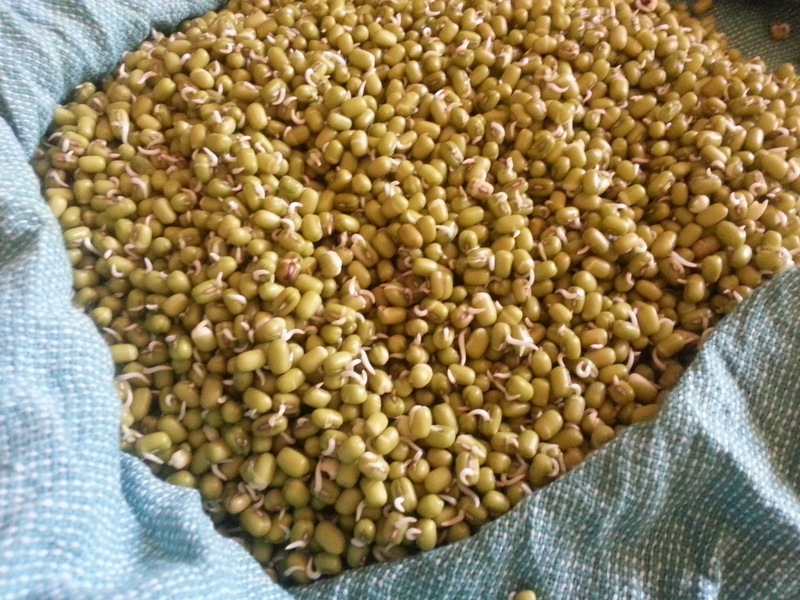 Take a cup of sprouted green gram in a bowl, sprinkle little water. Steam cook for 0 minutes. Take it off the stove. Heat oil given under "Tempering" in a kadai, splutter mustard seeds, add urad dal, hing, red chilies, turmeric powder and curry leaves. Saute until urad dal starts to change color. Next add the steam-cooked sprouts to this and mix well. Keeping the flame low, add coriander powder, fresh coconut and salt. Mix well. Let it sit for another 5 minutes for the flavors to mingle. Take it off the heat, serve it hot with a cup of hot tea or coffee or just as a snack with some walnuts by the side to nibble while you watch your favorite show. wow very healthy and delicious stir fry :) looks yumm !! Yummy and healthy stir fry ..!! very healthy one.. and i take it as plain.. very rarely make sundal and stir fry like this.